As we approach the 10th anniversary of SEMrush, we are preparing something big for digital marketers — data renovation — and we’re excited to share with you our first insights! Let’s see what these enhancements will bring you in detail. In this world of fast-changing search, we have to be flexible to stay on top, and in order to be flexible we had to change the core of our analytical framework — our keyword database. This implies that we are retiring outdated and untrendy keywords and filling our database with fresh and trendy terms. And now, using this update, you’ll get the most traffic-driving queries and high-quality longtails. Keyword search volume is vital data for building your SEO and PPC campaigns, for which erroneous data may waste your efforts. With this in mind, SEMrush is implementing a new machine learning algorithm for search volume forecasting and validation. This is a huge step that allows us to significantly raise our estimation accuracy standards. And now we can proudly proclaim that our volume estimations are the most accurate on the market, which will successfully contribute to the SEO or PPC strategy you’re building. Warning notice: We’ve already started the small databases update, and today we will be launching the update of larger databases, which will take one month. Due to the insertion of new algorithms and data, you might notice some spikes and drops in graphs. Don’t panic. 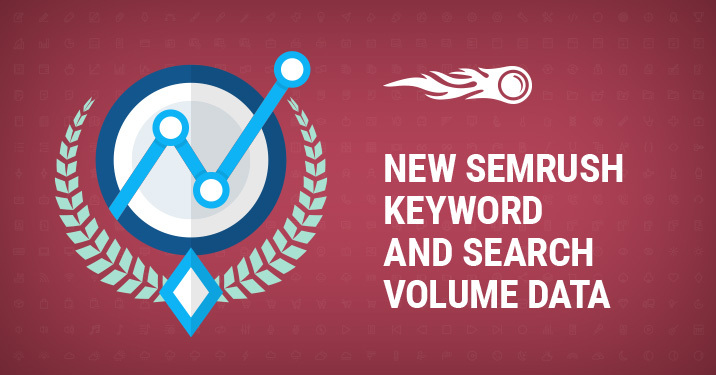 You now have the most accurate data on your keywords and search volume, and it is refreshed on a monthly basis. If you’re interested in more details, head over to our blog and find some additional insights. What do you think about this update? Share your opinion with us at [email protected]. This is only the beginning! More updates are on the way, so stay tuned!